Yuhuu! 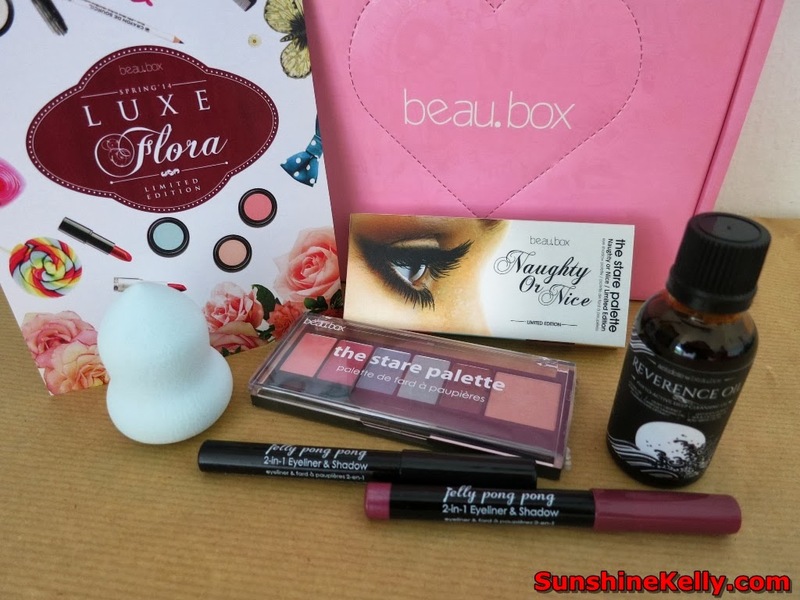 Beauty box that contains all the full size products non I received my Beaubox Luxe Floral Spring 2014, Limited Edition Beauty Box yesterday. Everything is still fresh and I am excited to share it here with you. 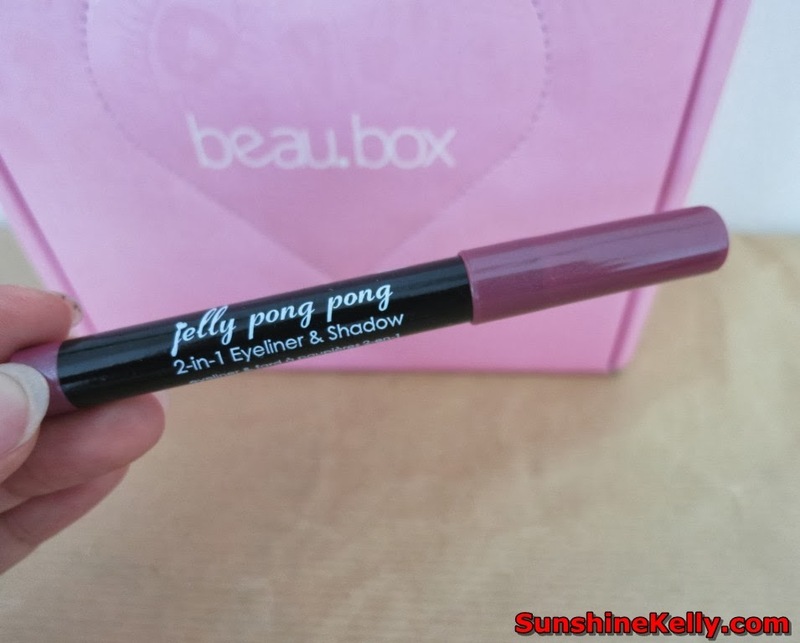 By the way, this is the January 2014 or second Beaubox and it was sold out already. The response was good, I think some of us like full sized product and do not mind paying a little bit more compared to the sample sized products. Oh lala! 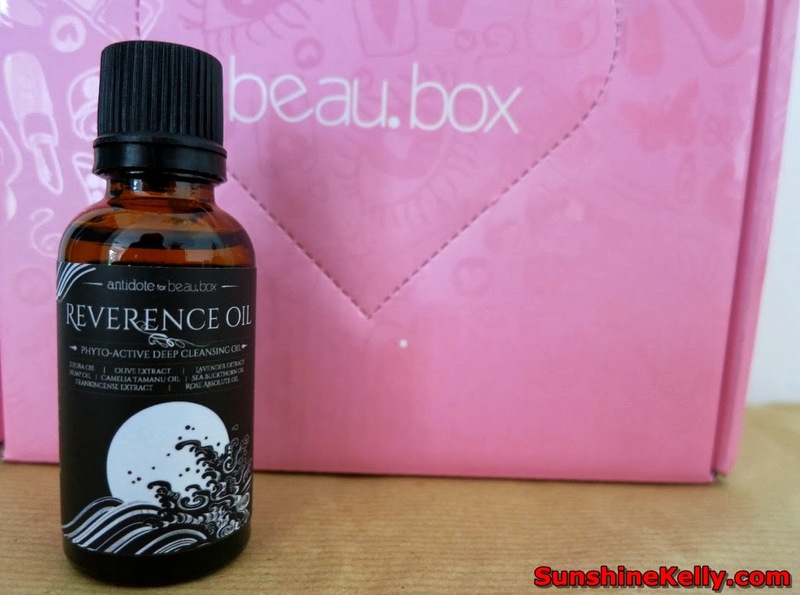 When I opened this BeauBox I thought that the Reverence Oil is an aromatherapy oil for massage but actually it is phyto active deep cleansing oil. Wow! this is not any ordinary cleansing oil, it helps to remove makeup, improves skin radiance and lifting effects. Reverence Oil melts away impurities and unclogs pores without stripping the skin of natural oils and pH balance.Because of its potent combination of rare oils ,the benefits are fit for royaity.From soothing over-exposed skin to skin rejuvenation ,this cleansing oil is highly prized as an elixir derived from the fountain of youth.Watch your skin glow & lift with just one use. Use a few drops of this luxurious oil and gently massage on the skin in a circular motion and rinse off thoroughly or use a warm dampened cloth to wipe. This is something versatile and useful for travelling. It’s a uniquely formulated crayon that doubles as an eyeliner for thick, precise lines as well as a perfectly blended eye shadow. The exclusive combinations of ltalian formulated waxes and pigments allows you to build up the colour, smudge or create bold lines quickly and easily. Bonus, the creamy texture with long-lasting hold, made with pure beeswax so you don’t pull the sensitive skin around eyes. To line, rest the elbow of your dominant arm on a hard surface, and rest your wrist on your face. Draw a line across the upper lid on the lash line (as close to your lashes as possible while still on the lid). This creates the desired illusion of having thicker lashes. Soften the look by gently smudging the line with a brush, cotton swab or your finger .Repeat with lower lids. To use as shadow, start at center of lash line to outer corner of eye for both top & bottom lids. Use a smudger / blender brush to smudge out the line, working out to the outer corner. Use the ring finger to smoke it out a bit more. Follow up by adding pencil from crease to outer corner and smudge it out just as you did with the lash line. This creates a 3-dimensional smokey look. This eye shadow palette comes is 6 vibrant colors inspired by Spring 2014 trends. Play it safe by complimenting the shades or just mix and match for endless on-the-go looks. 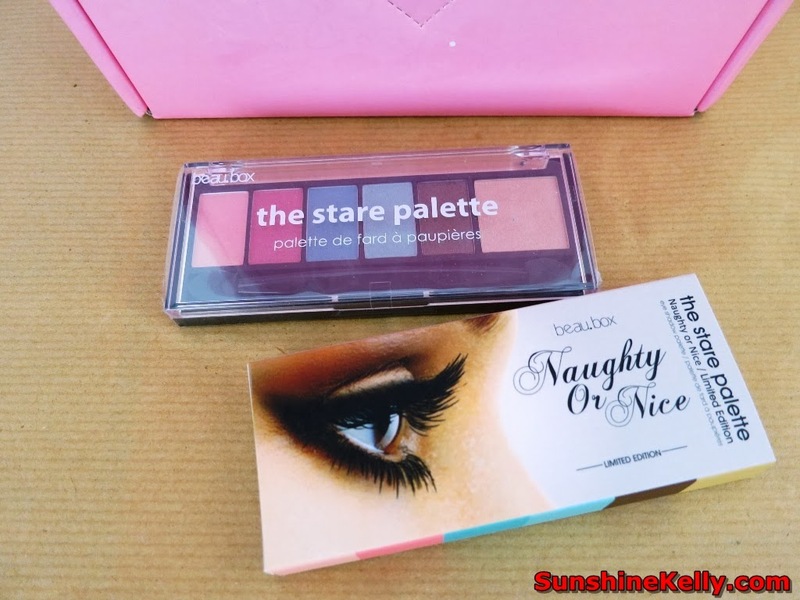 This multi-functional palette includes a light catching highlighter-sand-to create a nice highlight for your brow bone or even to highlight the bridge of the nose & a sweet pigmented shade – Mocha – for you to use as a liner or even a brow filler. 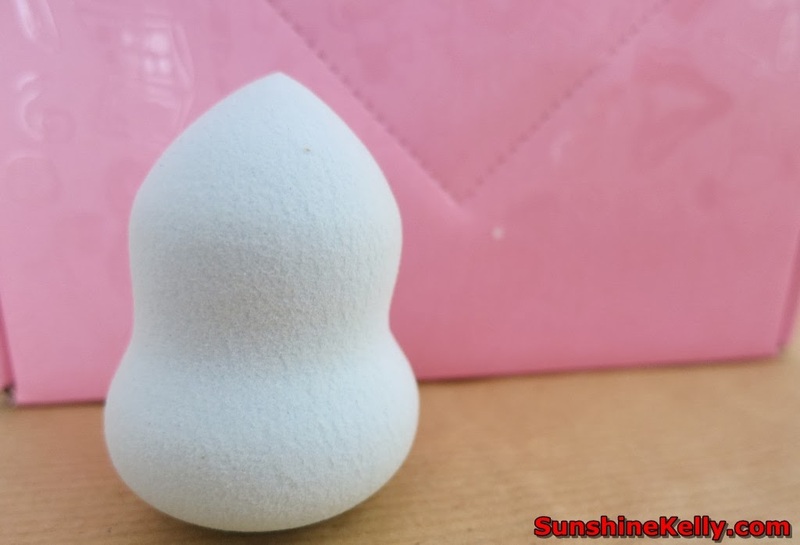 This blending is very useful for blending foundation and concealer that give an even and flawless finish. The pointed end is perfect for around the eyes and edge at the nose and the larger end is great for cheeks and forehead.